During the month of August, Woodard Cleaning & Restoration ran a community outreach campaign called “Pay It Floorward,” where the company invited residents of the St. Louis metro area to submit narratives highlighting their local heroes. 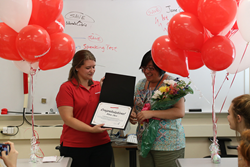 Woodard surprises first place contest winner, Edrin Chen, during class at Kirkwood High School. During the month of August, Woodard Cleaning & Restoration ran a community outreach campaign called “Pay It Floorward,” where the company invited residents of the St. Louis metro area to submit narratives highlighting their local heroes. The campaign allowed the local community to share the amazing stories of family members, first responders, volunteers, mentors, and others that have positively influenced the world around them in one way or another. All nominations were open for voting by the public, and the ultimate goal was to award the top 3 nominees who received the most votes prizes provided by Woodard. 4th Place: Bonnie, a St. Louis Crisis Nursery employee, whose nomination said, “She cares about every child that comes thru the doors, always with a smile on her face and love in her heart.” Woodard chose to reward Bonnie with 3 rooms of carpet cleaning services, and quickly found out Bonnie planned to donate this gift to the St. Charles Crisis Nursery because they were in true need. 3rd Place: Ron, a grandfather who provides love, wisdom, and unity for his family. Ron was awarded with a $500 gift certificate for in-home cleaning services by Woodard and a $50 restaurant gift card. 2nd Place: Patrick, a Glendale-area waste management driver who brings light, positivity, and fun to his community on a daily basis. Patrick is known for his “customer service and attitude [which separate] him from all others. He takes the time to make everyone feel special, even hopping out of his truck to give a hug, talk to a child, or honk and wave as he passes you.” Patrick was awarded 2 tickets to a baseball game, $750 in Woodard cleaning services, and a $50 restaurant gift card. 1st Place: Edrin, a Kirkwood High School Chinese teacher who has made a huge influence in the lives of her students. A former student’s nomination said, “I am eternally grateful for everything she has done for me and countless other students.” Edrin was awarded 4 tickets to a baseball game, $1000 in Woodard cleaning services, and a $50 restaurant gift card. Woodard would like to thank everyone who participated in this campaign and shared these incredible stories. For more inspirational narratives of local heroes, visit Woodard’s Facebook page.